The shelves of set designer Anna Louizos’ office are lined with shadow boxes that feature scenes from the various shows that she’s designed. They’re part of her effort to re-purpose set models, but they also offer a glimpse into the magical and hermetic worlds of her designs. Her body of work, ranging from big Broadway musicals to intimate plays, is also represented on the posters that line her studio wall and the set models with their moving parts. Anna has been Tony-nominated for her work on The Mystery of Edwin Drood, High Fidelity, and In the Heights. She’s also designed the sets for Curtains, Speech and Debate, Rodgers and Hammerstein’s Cinderella, and School of Rock, just to name a few. 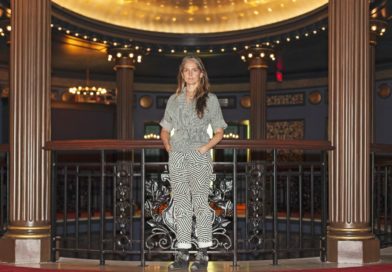 Most recently, she designed the sets for the Roundabout Theatre Company’s production of Holiday Inn, which takes audiences from the Connecticut countryside to the back lots of Hollywood. 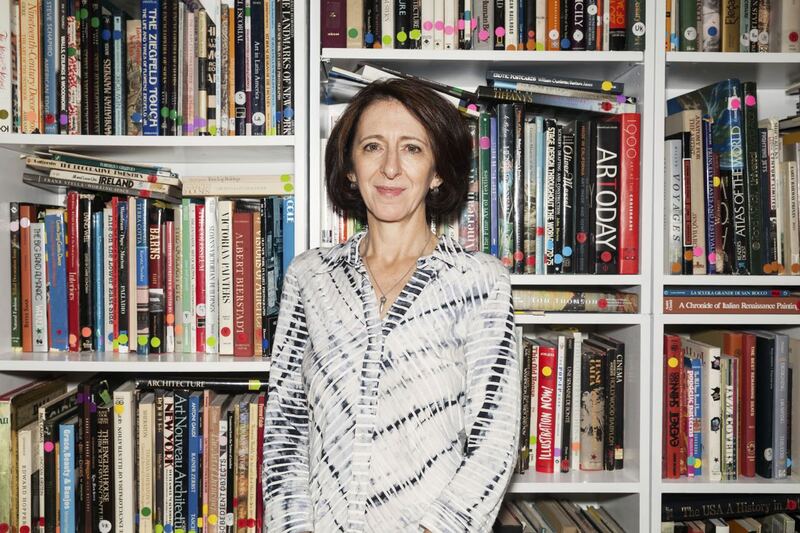 Anna is one of very few female set designers to have worked on Broadway, and we talked with her about her design process, her dream to start a theatre museum, the challenges female designers face, and much more. When you get a show like Holiday Inn, how does your design process work? You read the script, and then what do you do from there? The first thing I notice with a play like Holiday Inn is it reads like a movie. It’s based on a movie so it does read like a movie. I find that a lot of scripts lately, especially musicals, tend to be written with a kind of flow that reminds me of film, it’s where things just go from one scene to the next without any real thought about how you get from one place to the other. Holiday Inn, I’ve been familiar with that movie since I was a kid. I used to watch it on TV. I have a great affection for it and I love the fact that it’s set in the 1940s. Clearly, that’s an important way to convey the style of the piece. I start by pulling research, looking for stylistic visual material—magazines from the 1940s, home decorating magazines of the 40s. I have these Great American Home magazines that show advertisements from that period of time and the interior design look of homes. I pull anything that relates to each of the scenes, first of all, just for inspiration, and then I put together a book of visual material and meet with the director [Gordon Greenberg], and Gordon and I just start talking about how we think various things look. That’s the one component, the style of the piece, but then the other component is the nuts and bolts, and that’s really my job: to figure out how to get from a nightclub to a country lane, to the outside of the house, to the inside of the house, back to a nightclub, and it all has to happen in a very seamless way. I might start by making little thumbnail sketches of what I think the stage picture could look like and try to free my mind and not get too bogged down in how it happens, but mostly just think, “What do I want the pictures to look like?” Sometimes when I start that process, I start to notice where there might be something in common between [set pieces] that might allow me to, for example, form tracking portals or certain pieces that can shift on stage and off to create a larger opening or smaller opening. It’s a very complicated way to figure it out, but I think it’s like creating a jigsaw puzzle without knowing what the picture is. You need to make the puzzle pieces fit and eventually you have to figure out what the pictures look like. It’s a long, drawn out process, trial and error, flushing things out in model form, doing little rough model versions of things. It’s also very important to know the size and the limitations of the space. 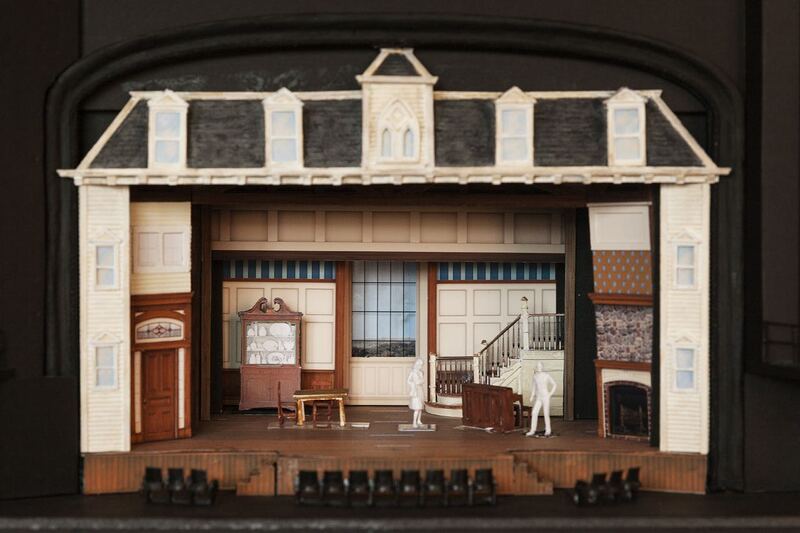 The first thing we do is we build a model box of the theatre so we know exactly what our limitations are. Right, there’s only so much wing space. [For example] We have to go from the inn’s living room to the inn’s performance space, and given the limitations of the theatre we only have so much depth, so we can’t go deeper into the inn, we just have to peel away what’s there so that we can create an open stage space. We wanted a nice staircase to suggest that there’s an upstairs. The staircase we have doesn’t fit off stage. The whole thing has to telescope so that it can get off stage. In the script it talks about how the house falls apart when he [Jim, the main character] closes the door and, all of a sudden, all these things happen. We had to figure out what sequence of events would happen that would indicate that the house is falling apart. The staircase had to be rigged specially so that the wood posts and the railing could collapse, and the curtain had to be rigged so that it could drop, and the picture has to go cockeyed. All these things have to be part of how the whole thing gets built. It just seems very complicated. Set model for Holiday Inn. What’s your process like for figuring out how to represent the tone of the show, especially with Holiday Inn where it’s a very specific type of musical comedy? Gordon was very particular about how he wanted it to look, and it was hard to articulate because he wanted it to feel like it was a period piece, but he also wanted it to have a slightly contemporary sensibility. It was hard to figure out exactly what he wanted, and it took many, many attempts with color combinations and patterns. We went through dozens of wallpaper pattern looks before we settled on one. And many, many versions of colors, and I wanted it to be neutral enough that it could work for certain places like that night club. We circled around many, many incarnations of the design before we settled on the color scheme that we settled on. I did White Christmas—that’s another Irving Berlin musical, which clearly has a life and has been playing a lot—and he didn’t want it to look like White Christmas, which I totally understand, to give it a distinction. The inn interior wanted to feel warmer and more wood toney and a little more rustic. That’s why I went more with natural wood tones and a stone fireplace, and also flushed out the inn in a different way because we spend much more time in the living room than we do in White Christmas. Then also in the performance space of the inn, he wanted it to feel whimsical and crafty, like the kids put together all the scenery. The curtain for Holiday Inn, which is the show curtain, is made of a patchwork of fabrics that spells out “Holiday Inn.” I just went and bought all these different kinds of fabric that I thought would be appropriate for the period and we inscribed how it should look, and then a scenic artist attached all these different patches of fabric and created what looks like stitching on the curtain so it looks like the whole thing was hand stitched with yarn, and along the bottom of the curtain there’s a rag mop fringe and big button details across the bottom to make it look crafty. That was the other aesthetic that he wanted to convey in this version of the show. What’s your process like for deciding how to invoke something rather than show it? Like part of a staircase to represent an upstairs, or how certain colors read as more modern and others less modern? We used a lot of faded colors in a lot of the scenery so it didn’t look primary colored. A lot of the print ads from the 1940s all have a slightly faded quality, and I think originally they did. They were not really vivid colors. The red is not like a fire engine red, it’s kind of an orangey-red, it’s kind of a pinkish-red. All of those colors are muted and some of the references, like for the Easter parade decorations, I pulled little bunnies and chicks and eggs from the period so that it looked they were conveying what was appropriate for the time, and the Valentine’s decorations I thought involved an 1940s quality. We used a lot of gingham print, painted gingham ribbons for Christmas, a lot of plaid, because plaid was very popular in the 1940s. Those were the kinds of colors and textures that we really wanted to have live on stage. Then we have two different drops. We have a spring drop that we use for the lovely spring and summer and then we have a winter drop for the winter months. For Fourth of July, we decided to play outdoors instead of doing it on the inside because we wanted to use firecrackers. I had to create an outdoor look for those scenes, and because of the limited space I couldn’t have multiple drops, but what we did was change how you saw the back by putting the house exterior in front of it or a fence in front of the drop. For the Fourth of July, having the arch trellis with the lights suddenly made you feel like you’re in a different place. Christmas, of course, is a big one, and having all the decorations appropriately rigged so that everything could go up very quickly because when all the dancers show up to surprise Jim we have to transform the inn in a very, very short period of time. Everything has to be rigged and worked very quickly. It took a lot of teching and figuring out who could do what. The design has a big impact on the pacing of the show. How much do you think about that? That’s my job, and I think that’s what I always talk about because I’ve watched shows sometimes where the show becomes about waiting for the scenery to change and, to me, that’s a failure. My job is to make the transitions happen and help in telling the story. Part of the transition is helping with telling the story. The more the transition is worth watching the better, because you’re helping to tell us where we’re going or continue the storyline somehow with some bit of scenic element that continues. A lot of it is back and forth with the director and the choreographer. It’s a very collaborative discussion because not everybody has the answers. The book writer doesn’t have the answers, they just say you go from here to there. They don’t really talk about how you get there, they just hope that you can get there. Then the designers and choreographer and director figure out how can we get from this scene to the next and how can we continue the tension and the storyline. There’s a lot of throwing out of ideas and we’ll try something and then go, “Oh, it doesn’t work. It takes too long. Someone has to change their costume, they need five more seconds to get into their costume.” Then we have to figure out something else to do. It’s always new and it’s always challenging with every show, and it’s exciting, and when it works, it’s fantastic, because then it becomes like, “Oh, that’s how it gets done and that’s how we should it,” but it took a lot of brainpower to figure it out. That’s just the nature of this business. 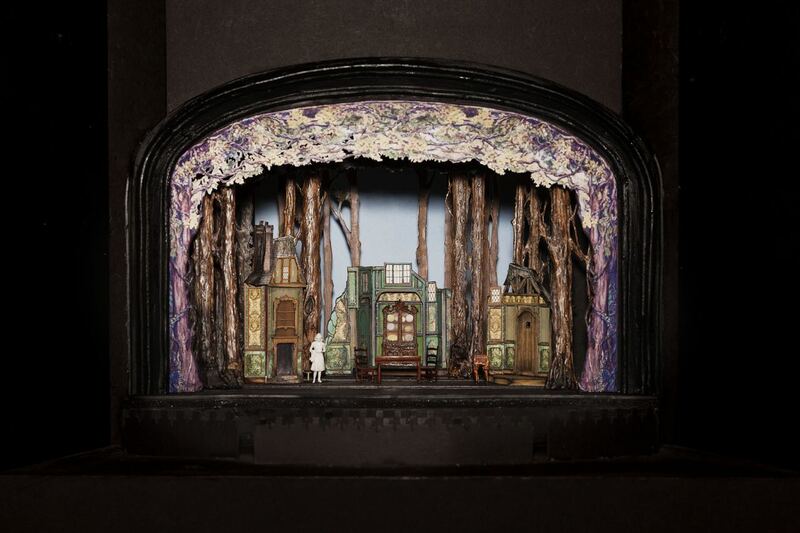 Set model for Rodgers and Hammerstein’s Cinderella. Does not having the actors involved with the set designer until tech make it more difficult? In a way, it’s easier before you bring the actors in, because you’re working on all the hard stuff. It gets hard when the actors are on the stage too, but the more time we spend really walking through the show and talking through the show with the model and saying, “We’re going to get from here to here by doing this, this, and this,” it’s a lot better to do it when it’s all on paper, when it’s all on little pieces of cardboard, than it is when you build it all in the shop, and all this steel and plywood and everything gets delivered to the theatre, and then suddenly this doesn’t fit. It poses a much bigger endeavor to try to have to rectify things. We do as much as we possibly can, and try to troubleshoot as much as we can, but when we get into the theatre and we tech, that’s where the really hard part starts where you suddenly have human beings that have to relate with the scenery and change their costumes and focus lights in certain places. Fortunately, we had a good chunk of tech time for Holiday Inn, which allowed us to really make some good changes and make some adjustments. …If the door is on that side. That’s the problem and, unfortunately, I think it’s economics because once the actors are hired, that train is on the tracks and it’s not going to stop. It would make so much more sense to me practically, and for the life of the show, if you were to have a theoretical design in place, rehearse for a few weeks and discover all the problems, and then go back and revise the design, and then take it to the shop. But usually by the time the actors are in rehearsal the shop is already building the scenery, because everybody has to time everything so that the scenery’s getting built, it goes into the theatre, the actors finish rehearsal, and they go on stage because they can’t have a break between rehearsal and tech. There’s a lot of communication that has to happen during rehearsal, and the minute there’s an issue that comes up and the red flags start and like, “Can we change this,” I have to call the shop and say, “Can we change this,” and sometimes we can and sometimes it becomes a money decision, because if it’s already been built, then the producer has to decide if it’s worth changing. That happens. How do you think work can be better developed? I think in that way. As a matter of fact, for School of Rock we did that. I started to design School of Rock, and rather than doing out of town tryouts, the producers decided they were going to do a workshop, but a paid workshop in a venue. We did a workshop at the Gramercy Theater on 23rd Street, that rock and roll venue. We all went into the space and Andrew [Lloyd Webber] decided, “We should do a workshop. We’re not going to go out of town. It’s so expensive. We’ll just do it and we’ll stage it here and we will work on it during the week, and on weekends we will charge for tickets and people will come and see this rough version of the show, and then at the end of the weekend we’ll asses what needs to change and we’ll make changes during the week,” which is exactly what we did. During that process I had pretty much designed the set. It wasn’t going to be a scene set though, it was just a design. We knew exactly what we had, I had a model, and then we did the workshop. It was a three-week thing. We did three weekends of the show. Originally, in my design, you walked into the theatre and on stage is the huge exterior of Horace Greene Prep School. When we did the first week of the workshop, Andrew said to the audience, “Obviously there’s no set, but this is what it’s going to be,” and he described it and we did the show. They concluded at the end of that first weekend that they had to completely change the opening because if the children are seen at the very beginning of the show and then you disrupt that with Dewey, the slacker guy, something happens with the energy of the show. They decided they had to switch it and have us see Dewey first and then see the children, which means we don’t need the exterior of the school at all. I had to cut an entire set piece, and it was integrated into the design, but it was just on paper and it was just in model form. That following weekend they performed it with a different opening and they said, “This is what works. We want to do it this way.” I had revised my design and then at the end of the workshop I continued to refine things, and then we went to the scene shop and starting building, and then when we went to Broadway it was that version. It was a huge help. It saved a lot of money in the long run. In that case I think it was smart, and I think that that model might actually be a very wise future model for developing musicals, because a lot of times what they do is they go out of town with all the scenery, it’s all built, you pay people per diems and they all have to be put up in hotels and usually you discover that things needs to change and everything goes back to the scene shop and gets revised and gets rebuilt, and then it goes to Broadway, if it comes to New York. Just imagine how much money they could have saved. I think it would be great if there was some kind of a break between a two or three week workshop, where they could rehearse the show and discover any changes they want to make or pitfalls in the initial design, so that they could revise the design before building it. That’s my recommendation. 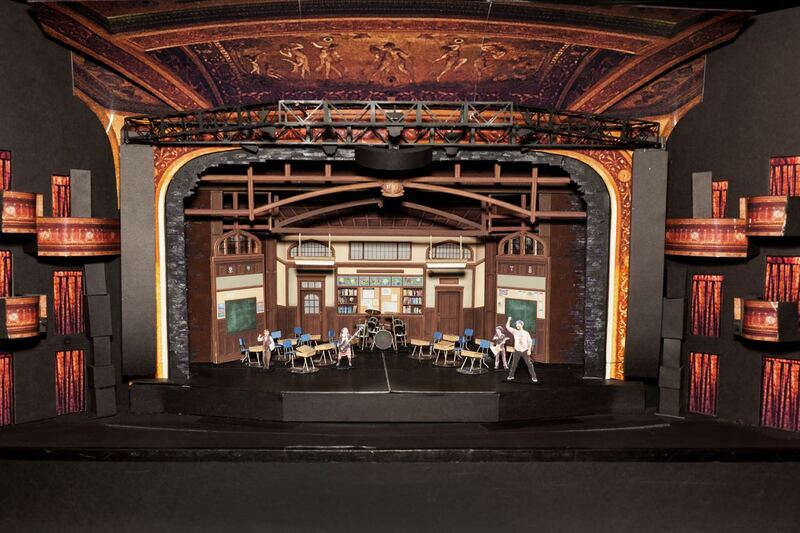 Set model for School of Rock. Do you find that the actual physical Broadway theatres are limiting? Oh, yes. They’re old. They’re 100-year-old theatre spaces where they were built for painted drops, basically. Modern engineering has certainly allowed us to exploit as much of the space as we possibly can. There have been basements dug deeper in some of these theatre spaces and holes cut in to bring things up on elevators. Honestly, I like the limitations. If I had an endless amount of space and money, I don’t know what I would do with myself. It would blow my mind. I couldn’t handle it. It’s better to have limitations, it’s always better. The script says this is what the play is, so then it’s like, “That’s my challenge. How do I get from this scene to that scene,” and then I have really use my imagination and ingenuity and figure out ways to make it work, and cleverly. What other areas of culture affect your work and your design process? Music, I would say, is the big one. Yes, I love music. I’ve always loved music. It’s been a big part of my life. I’m a musician. I perform. I can appreciate what it’s like to perform on stage. I think also putting myself in the shoes of the audience. I want to make sure whatever I do is going to be delightful for people to watch and also surprising. I love building surprises throughout the show so that it’s not like, “I get it. This is what the set is. It’s not going to change.” I always like to surprise people. If I can find unconventional ways for scenery to get on stage, I try. It seems like theatre hasn’t quite caught up to other areas of culture and entertainment in terms of how to best utilize new technology. Yes. There’s so much technology now that’s available to certain entertainment streams. Generally, it’s the ones that have huge budgets. I think Broadway, at one time, was a place where the latest storytelling or entertainment component was available to audiences. Right now, television really is one of the richer places for storytelling. There’s some amazing stuff on television now. The best writing is on TV right now I think, and that worries me because you can’t replicate certain experiences any other way except to be in the space and to get the feedback from the audience, and for the audience to see that their presence makes a difference. You can’t duplicate that. It’s like a sports event. There are three forms of entertainment that will never die and that’s theatre, sports, and concerts. Those three things seem to be very much alive still. I don’t think we’ll ever lose those things, because there’s something about the crowd with the performers. There’s this synergy that happens—it’s exciting and I think they love it and they crave it. That will never change, I think. Finding ways to keep them engaged in an ever more digital world where people’s attention spans have diminished considerably maybe requires that we adjust the kinds of entertainment that we provide for people. But I think once you show audiences what it takes [to put on a show], then I think there’s a greater appreciation for it. It’s hard for people to see that because we make every effort we possibly can to make what we put on stage to look effortless, and in a way we sabotage ourselves because it looks so easy, but the fact is it’s not at all. When you try to make it look smooth and effortless it’s like they take it for granted. It’s crazy but that seems to be the case. 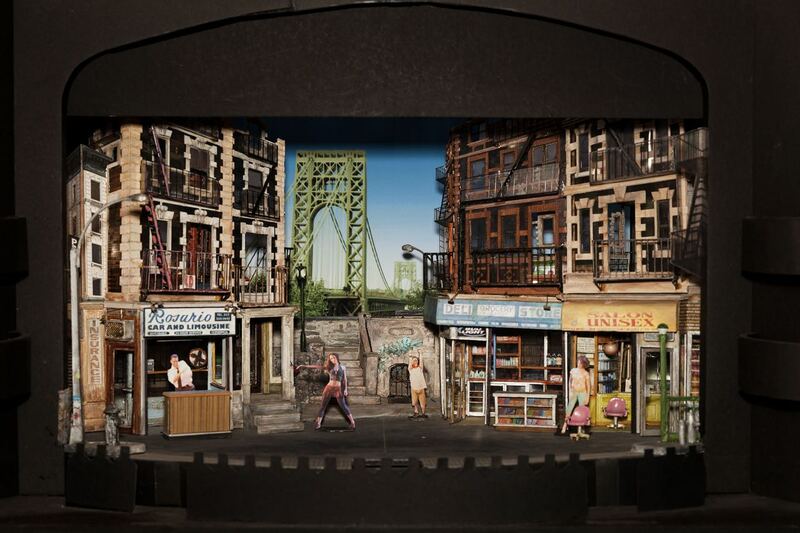 Set model for In the Heights. When we were looking at the set models, you mentioned you wanted there to be a theatre museum. My long-term goal. Before I die I think it is imperative that the city of New York commit to creating an institution that is devoted to the American theatre, and what more fitting place would there be than in the heart of the theatre district? There are plenty of people who own property in the theatre district who I think would do a tremendous philanthropic gesture, if they were to offer a space that could become devoted to American theatre. The heart of the American theatre is New York City, and if a place like this can’t support something like that then no place will. Lincoln Center Library is admirable in that they archive and preserve things, but it’s a library, which means it’s limited to certain people and you can watch a recording of a show, but you have to sign your life away. You have to sit in a booth, you can’t have anything in there, you have to watch it, and that’s it. It should be accessible to people. I think everyone should be able to see what takes place backstage. What a great place to preserve models. What a great place to show the history of Eugene O’Neill’s productions of The Iceman Cometh and show models from decades past and do a whole exhibits about specific things, and you have living people who work in the theatre who are right here. You can have all kind of symposiums and lectures. It would be a great tourist attraction. And it would preserve all this work that gets done that ends up in people’s closets or ends up getting thrown away or donated to BroadwayCares or sold on eBay. 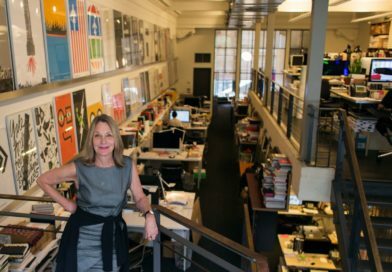 I started this website in an effort to at least create an awareness and appreciation for designers and what they do, it’s Broadway Design Exchange. It’s a website where anybody in the business can sell their models. They can sell sketches. People who own memorabilia from shows, if they have a prop from a show and they want to sell it, they can sell it on the website. Like 1stDibs, but for Broadway. Yes. It’s your online marketplace for theatrical treasures: original artwork, set sketches and renderings, costume sketches and renderings, props, furniture, models and miniatures, one of a kind items. I just thought, there are so many people like me who work from job to job, and there are plenty of assistants that have tremendous skills. There’s no reason why they couldn’t make something and sell it on the website. So, you’re one of the very few female set designers working on Broadway. I feel like we’re at a period of time historically right now where it’s like, “A woman’s running for president. Oh well, no big deal.” You know what, it is a big deal, and I think we’re lying to ourselves if we’re underestimating that we’re at an important place in history. It’s not cool to shake your fist and say, “Look where I am,” but you know what? It is a big deal, and I have my Hillary button on my backpack right there. It took a lot of other women peeling away at the layers for women like us to be where we are, and even for me it’s been more peeling. Does it feel like extra pressure to be one of the only ones? I don’t feel pressure. I just feel like I still have to fight. 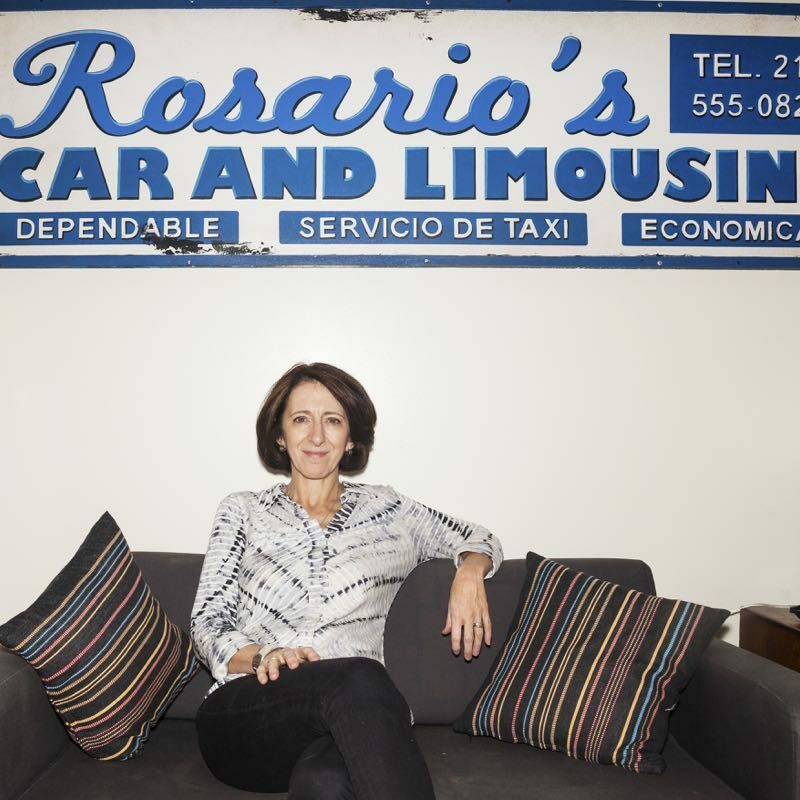 It’s still very much a male-dominated business, even though there are plenty of women working in it. I think if we got a bunch of women in a room they would admit the fact that it’s still a male-dominated business. Do you feel, or did you feel when you were younger, that you have to think about how you present yourself more than your male colleagues? For example, in terms of how you dressed or making sure that you were getting heard, things like that? I felt like knowing what I was talking about was really, to me, the most important thing. I need to know what I’m talking about. I need to understand how things work scenically. Just knowing my craft was the most important thing first. That doesn’t necessarily get you to the next step. Being persistent is another one. Also, appreciating the fact that it is so much a collaborative business. Never make enemies. There’s no reason to make enemies. You need other people to achieve what you do. I’m not a lone wolf. I can’t do any of this by myself. Understanding that and appreciating what other people do to help me achieve my goal is critical. Being nice is important. Maybe because I’m a woman I feel like I have to be nice, that’s probably just in my nature. I worked as an assistant for many years, and men hired me and [other] women, but I worked for plenty of men and [with] certain people, the way they treated other people stood out to me. I think I wanted to model the way I work in a way that was similar to how certain people I respected treated people. Tony Walton is my hero. He’s one of the most wonderful designers and human beings in this business. It’s hard for me to talk about what’s different about being a woman. It’s come up in other interviews where women have said they felt like there was less room for error for them or they felt they had to be doubly prepared in meetings. It’s true. Men are always giving each other passes, that’s the truth. They just do. They talk to the men in the room, it’s just in their nature. They’re talking to their tribe and we’re a different tribe. We stand out because right now the balance is off, and until the balance is equal we’ll always have to contend with that. Why do you think there are so few female set designers? 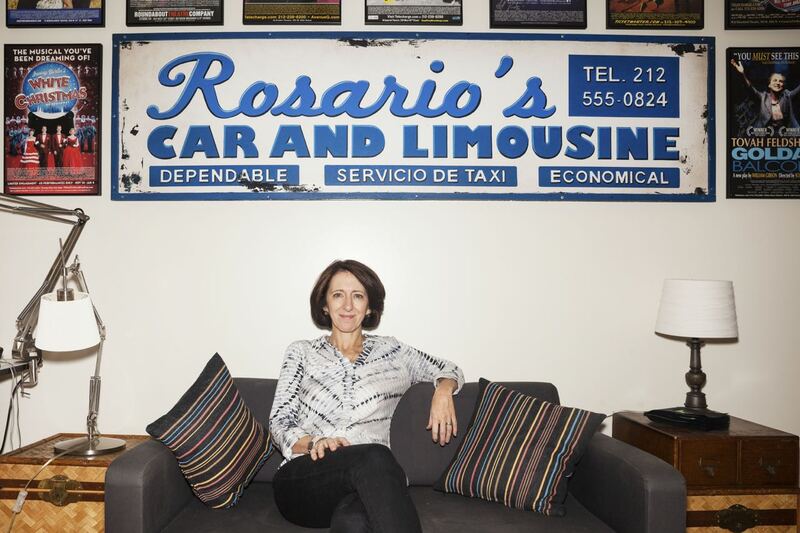 Just like there used to be few female lawyers, but now it’s changing. There’s still a lot more CEOs that are male, there’s a lot more heads of everything that are male. That’s because it’s taken decades in the job fields for that to shift because women only got to vote in 1920 and you’re talking about 100 and something years prior, 200 centuries worth of women never being in positions where they could make decisions. Do you feel like there’s a bias in terms of who gets hired for big Broadway musicals because there’s so much money and who is trusted with that? I feel like I’m in a unique position when it comes to that because I’ve done huge musicals. I just happen to be one of the few. Most producers are very gun shy when it comes to hiring somebody new. They only want to hire somebody that they know who they’ve seen what they’ve done before. It’s that catch-22 always like, “How do I know you can do this show because I’ve never seen you do anything like it?” That was the case with me before I got hired. Nobody knew what I could do until they hired me, until they trusted me, and often what they do is they pigeonhole you. They say, “I need someone who does abstracts. Let me hire the abstract designer who did that abstract show.” If I want a musical that has multiple sets, let’s hire the person who did that set. Designers are very versatile, they can do anything. Most designers can do anything, and it’s having a producer with vision and willingness to take a risk or dig a little deeper to see what you’re capable of. Until you have someone like that in your corner, it’s really tough to break though. It’s like you’re hired based on what you did the last time or based on the kind of work you do. Unless you’re working with someone who has gone up the ranks with you, say a director for example, who the two of you have worked on no-budget projects down on the Lower East Side and you’ve come up together and that person finally gets a break, usually if they’re smart they’ll take you with them and you’ll have your first opportunity that way. Otherwise it’s really hard. There’s no direct path to where I ended up, it took me many, many years. I worked as an assistant starting in 1980. What’s something you think can be done to make things better and more equal for women in theatre? It’s gotten more and more expensive. It’s gotten more and more elite. It costs so much to go to the theatre now. You want to make sure that you’re spending your money on something that’s worth seeing. You don’t want to just go, “Let me go check out this play,” if it’s going to cost you $125. You need producers who are willing to take more risks and open their minds up to more than just this handful of people that do things over and over again. I would like to be one of those people that gets to do things over and over again. I hire plenty of women on my staff and I think, unfortunately, it’s not going to be a revolutionary change. It’s going to be a progressively slow but steady change, because many more women are doing what I do than when I started. That’s clearly an indication that it’s changing, and honestly I have to say I’ve noticed even in the theatre, the crews, the way they treat you is very different than when I first started. It was an all-male club where they looked at you like, “Little girl.” Now they’re like, “Anna, what would you like me to do?” They’re much more deferential and much more respectful, and that’s true of my associates and my assistants too, they treat them very well. It’s a slow but inevitable change that I see happening. Designers deal so much with the crew and with the people in the shop, and that must have its own environmental challenges. There are more crew people that are women too, and more women in the scene shops. ShowMotion, that built Holiday Inn and School of Rock, the foreman is a woman. She runs the shop and she said to me when I was working on Holiday Inn, “You wouldn’t believe, we have so many more women on our crew now, the welders and carpenters.” There’s a lot more women doing it now. I think the schools are turning out more technical people who are women. It seems to be happening across the board, not just in theatre, across the board.